Poland’s last communist leader, General Wojciech Jaruzelski, has gone on trial in Warsaw on Friday. He, and former senior figures of the communist government, are being charged over the declaration of martial law in the country in 1981. The hearing began with the reading of an indictment by the prosecutors from the Institute of National Remembrance (IPN), established to investigate Nazi and Communist crimes committed in Poland. Former First Secretary of the Polish United Workers’ Party (PZPR), General Wojciech Jaruzelski, former interior minister, General Czeslaw Kiszczak, and another former party First Secretary, Stanislaw Kania, are accused of Communist crimes and “leading a crime organisation” – the Military Council of National Salvation, declared the only authority in Poland during the period of martial law. 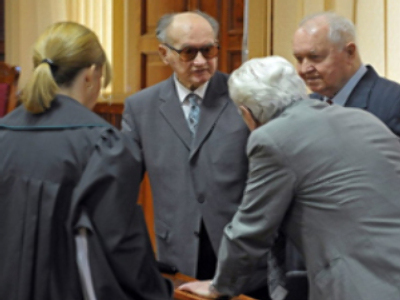 Jaruzelski, who is 84-years-old, is also charged with abusing his powers and forcing unconstitutional decrees. He faces up to 10 years in prison if found guilty. Kiszczak did not appear in court due to health reasons. But the judge found his absence unjustified and the hearings went on without him. Kiszczak is now 82 years old. He’s facing a maximum of eight years imprisonment if found guilty. Jaruzelski’s government declared martial law on December 13, 1981. They were aiming to avoid Soviet invasion and prevent opposition movements from gaining popularity and political weight in Poland. Thousands of people were arrested during martial law, which was raised in July 1983. The defence for the men maintains that accused are not guilty because they were acting “for higher reasons, due to the threat of Soviet invasion” in the difficult times Poland was experiencing. But during the rule of President Boris Yeltsin Russia revealed documents, which show that the U.S.S.R. was not planning to send troops to Poland, and it is known that the Soviet Union rejected to Jaruzelski's request for military help in 1981.